What's interesting about WWD's piece is that the story appears to quote some wildly optimistic traffic numbers for said blogs. It reports that O.G. fashion blogger Bryan Grey Yambao — aka Bryan Boy — gets traffic of "4 million pageviews a month." Kelly Framel's blog The Glamourai is said to have "about 4 million [pageviews] per month." Former Dazed & Confused contributor Susie Lau's Style Bubble is said to get "at least 1.2 million page views and 550,000 unique visitors a month." Leandra Medine, who's behind The Man Repeller, gets "1.5 million page views per month." And, again according to WWD, Rumi Neely of Fashion Toast has "more than 1 million per month." The story then goes on to vaguely outline the many kinds of brand collaborations and "partnerships" that actually keep these stylish young people in Fendi loafers and Margiela couture. The quoted sample post from Fashion Toast includes a lavish description of a Rag & Bone ("one of my favorite brands") vest "that was sent to my hotel" — to give you an idea. Four million pageviews a month is a significant audience. An audience that should attract a lot of advertisers, obviating the need for such shilling. 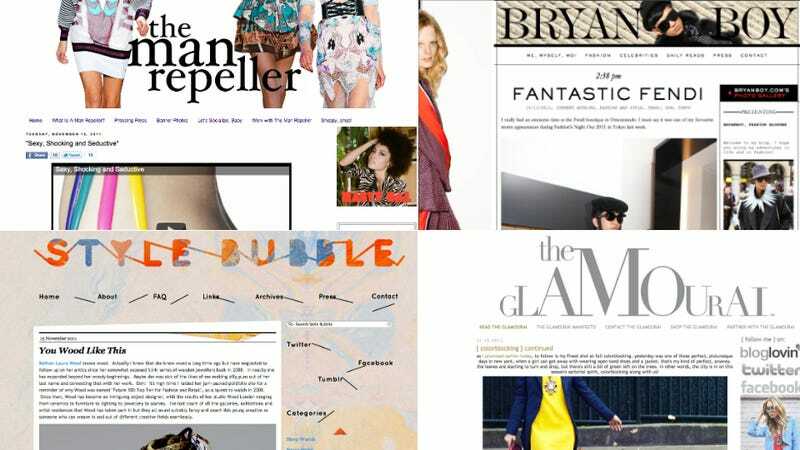 And yet, of the above sites, only two — Fashion Toast and Bryanboy — carry significant third-party advertising. Currently, both are running the same big ad for Derek Lam's diffusion line, 10 Crosby. Man Repeller, meanwhile, has a number of smaller sidebar ads. And only Bryanboy tells WWD that advertising is his "main source of revenue." Quantcast says, "Traffic data has been hidden by the owner." Compete puts the site's traffic in September (the most recent month for which stats are available) at 5,213 U.S. unique users, but the service warns, "The sample size for this site is small." Quantcast: "We're currently unable to display data for traffic." Compete: 6,960 uniques, but again, "The sample size for this site is small." Quantcast: 52,100 people visited the site, worldwide, in the last 30 days, generating 554,500 pageviews. Compete: 3,771, but —you guessed it — "the sample size for this site is small." Compete: 13,877 but, "the sample size for this site is small." UPDATE: Medine emailed to say that as far as she is aware, WWD sourced its 1.5 million figure about her blog's traffic directly from her. She also says that she was approached about this piece in September, so some of the information is slightly out of date. According to a current screenshot of her Google Analytics dashboard which Medine provided, ManRepeller.com got 1,755,067 pageviews in the past month. Compete: 13,783, but, "The sample size for this site is small." Some bloggers feel pressure to wear or write about a certain product in order to maintain a good relationship with a brand, in hopes that either more free product–or a paid gig–will come their way as a result. One popular blogger we spoke with, who wished to remain anonymous, told us, "Right now, all brands are doing the same thing: They're sending free product to bloggers or to online fashion publications and having them feature the product. It's a slightly vicious cycle of bribery." Framel, meanwhile, tells Fashionista that she always makes such disclosures. "I recently walked away from a sizeable offer from a brand," she says, "because they wanted to dictate what the verbage [sic] was and how I presented their product. They were assuming that we could have the same relationship as they would have with an advertorial." The same relationship as they would have with advertorial. That's a pretty frightening sentence, if you're a blogger or a reader of supposedly independent blogs. Of course, this isn't a problem confined to the Internet: fashion as a whole pretty much runs on gifts, relationships, and favor-trading, and the media that cover it are, with very rare exception, more or less party to the system. Fashion, for being such a public industry, can be notoriously thin-skinned when it comes to criticism. (I, for one, am not surprised in the least that brands frequently request changes be made in the copy of the blogger who is considerate enough to send it to them for approval. Of course, that's why one of the most basic rules of journalism is never send copy to a source for approval.) And most of the sector's flagship media brands — the big ladymags that make fashion their business — offer little sign that they even hold notional respect for the traditional separation between editorial and advertising. They are hardly role models on the issue. Pretty much everyone believes, at least notionally, in a "line." Somewhere way over that line, maybe, is Derek Blasberg, who's received thousand-dollar "consulting" payments from brands he covered at Style.com. But bloggers who take free merchandise, or collect consulting fees, from companies they write about — where do they fall on that spectrum?